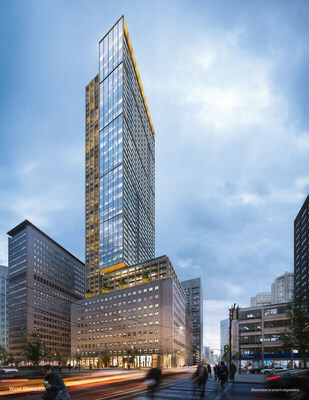 TORONTO, April 4, 2019 /CNW/ - The UNITED BUILDING in Toronto, announced by Davpart Inc., is North America's tallest architectural heritage retention development. Said Davpart Inc. President and CEO David Hofstedter, "From 1910 to the 1980s, 481 was the location of Maclean Publishing and later Maclean-Hunter with several buildings added to become one of the most recognized structures on University Avenue." During the 20th century, Maclean-Hunter grew to become the largest Canadian publisher of trade journals and the home to flagship Maclean's Magazine, Chatelaine and the Financial Post newspaper. "The existing structure is an example of a commercial building from the interwar era and is the result of many bold design influences, from Beaux-Arts to Modern Classical. While restoring the exterior, we will complete the interior to the highest standard of contemporary office and retail available today, so their current uses can continued," Hofstedter added. Mark Berest, B+H Architects Principal said, "The design of this building draws from the energy of its location at the intersection of the city's primary cultural, institutional and retail anchors as well as its preserved architectural cultural heritage. It is a tribute to Toronto's cosmopolitan character and considers a new convergence of live, work, and play." Said ERA Architects Principal Graeme Stewart, "Our heritage work includes retaining, restoring and enhancing two large and significant buildings. The first is a noteworthy 1930s collegiate gothic building by Toronto architect Murry Brown, designed with New York's Schultze & Weaver. The second, designed by Marani & Morris architects is a midcentury example of modern stone office towers that contribute to the distinctive character of University Avenue." The UNITED includes 224,245 sq. ft. of commercial office space and 39,320 sq. ft. of retail space up to the 10th floor where the 759 residences units begin. 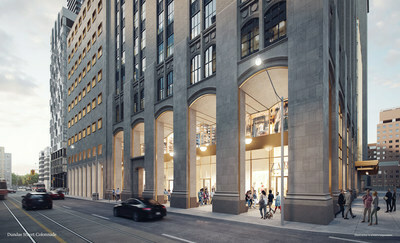 The front door to 481 University leads to the offices and retail; the residential condominium entrance will be at 88 Centre Street, offering direct access to the TTC's St. Patrick Station from inside the building. Added Hofstedter, "481 has a grand and iconic presence on University Avenue from Dundas to Centre Streets and is designated under the Ontario Heritage Act and listed on the City of Toronto Inventory of Heritage Properties."